The world that Gotrek Gurnisson knew is long dead, alongside every soul the legendary monster slayer once cared for. Adrift in this curious new age, the duardin scours the treacherous Bone Desert in search of the axe he inherited from the God Grimnir, which too has been lost to the annals of time. When a series of assassination attempts strike, Gotrek and his aelf companion Maleneth soon learn that it is not only the wasteland’s ravenous beasts and sinking sands that hunger for their flesh. The heroic duardin is certain these highly calculated and creative attacks are the work of his infamous nemesis – the skaven, Thanquol. But is all as it seems? Released as part of the first Black Library Novella Series, these two books tell the story of what prevented two loyalist Legions from rushing to Terra’s defence during the final push before the Siege. If you’ve been following the Horus Heresy series, then I definitely recommend you read these very good novellas. I was first introduced to Gotrek Gurnisson and Felix Jaegar in a short fiction snippet in (I think) the fifth edition of Warhammer Armies: Empire book by William King — this was, I believe, their first appearance, too. After that, I read King’s short stories featuring the pair in the early Warhammer anthologies Wolf Riders, Red Thirst and Ignorant Armies. This was all before Black Library was established, and the Gotrek & Felix series was launched in earnest. I read all of King’s and then Nathan Long’s contributions to the series, and finally David Guymer‘s ‘conclusion’ to the series in the End Times novels, Kinslayer and Slayer. I was sad to see the characters’ stories end. 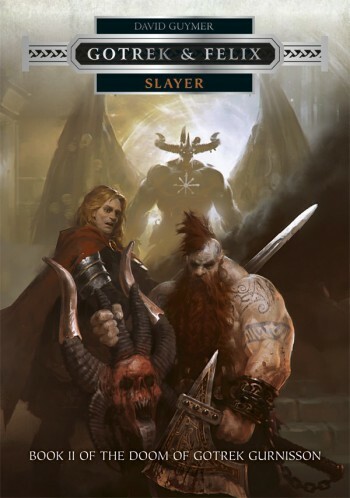 This October, however, Guymer is bringing Gotrek back for the Age of Sigmar in the audiobook Realmslayer! Gotrek Gurnisson was the greatest monster slayer of the age, who met his doom at the End Times. The heroic duardin stepped forth into the Realm of Chaos to fight the daemons gnawing at the world’s ending and satisfy his death oath, leaving behind his companion Felix Jaeger. Now Gotrek has returned, having outlived the old gods and the Old World. Spat from the ruinous depths with his redemption unfulfilled, he emerges into the Mortal Realms, a strange new world where gods walk the earth and dark forces are ascendant. Nothing is as he remembers. His oaths are dust, and the lands are torn asunder by Chaos. Yet when Gotrek learns of human champions being elevated to immortality for Sigmar’s fight against this darkness, the so-called ‘Stormcast Eternals’, he knows why fate has brought him into this new age. To find Felix. For only then can he find the peace in death he seeks. But is there more to Gotrek’s apotheosis than even he can fathom? Has he truly been chosen by Grimnir and for what purpose? In each of the stories mentioned below, the performances are excellent, and the production values superb. This has become an always-met expectation for Black Library’s audio-dramas.